This weekend the New England Patriots (currently of DeflateGate infamy) are lining up against The Seattle Seahawks in the Superbowl. I hope you’ll be surrounded by friends and family this super sunday eating great food and enjoying a break in the busyness of the new year. Here’s our big news this week. Take a look at the fine print up at the top. This is based on just $0.10 per kWh, imagine the savings in the NY metro area. We are very used to simply installing local occupancy sensors and photocells. When these systems get connected back to a central building management system we unlock the potential for even greater savings. 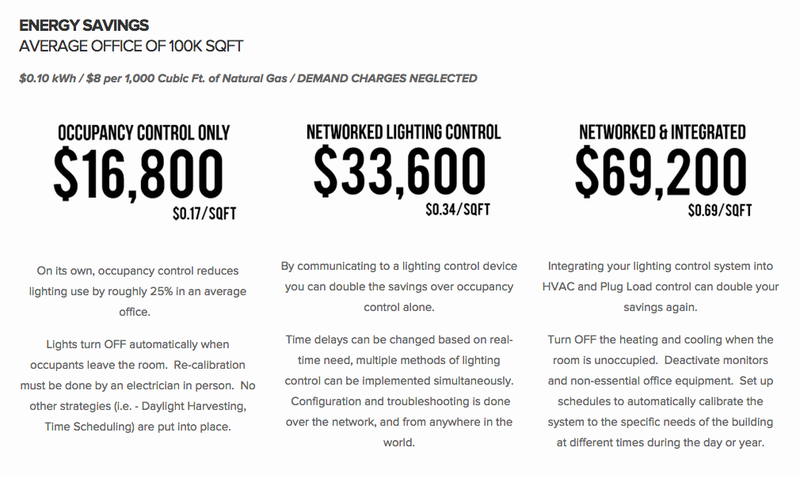 Centralized control allows for tweaking of settings such as sensor sensitivity, task tuning, and daylight harvesting. Centralizing control allows for connection to HVAC systems to allow for even more savings. Want to learn more about YWire, take a look at the video below. Ready to learn more about YWire? Of course you can head to their website. Or you can contact us and we’ll get you specific answers to your questions. Have a Super Weekend. More next week!